The World's Foremost Authority Has Died: Prof. Irwin Corey Was 102 : The Two-Way Who else could have appeared in the 1976 film Car Wash — and also accept a National Book Award on behalf of the reclusive Thomas Pynchon? Comedian Irwin Corey was known for his long-running act as "The World's Foremost Authority." He is pictured here in the 1970s. Corey died at the age of 102. 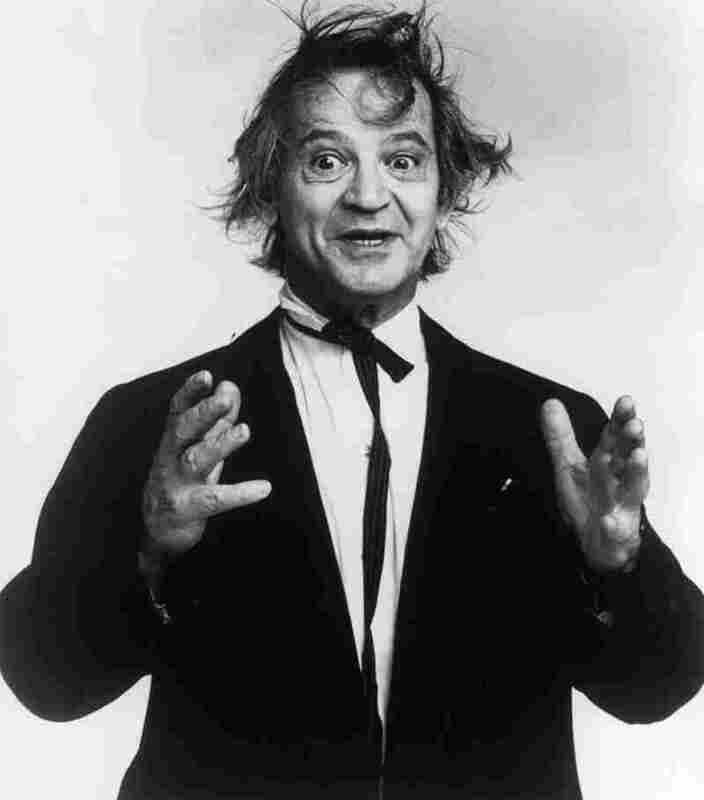 Comedian and actor Irwin Corey, for whom the word "however" was the perfect opening line, has died at age 102. With an impish grin and wild hair, Corey was a nightclub and talk-show fixture who worked with stars from Jackie Gleason to Woody Allen. His admirers ranged from Damon Runyon to Lenny Bruce. Corey died Monday evening, his daughter-in-law tells NPR. The comedian had been sick earlier this year — but he'd been sent home from the hospital after seeming to recover. His last meal, she said, consisted of ice cream and egg drop soup. It's impossible to provide a short explanation of Corey's surreal brand of comedy, which was most potent when delivered in his seemingly nonsensical stream of non sequiturs. But the breadth of his career hints at his creative genius: Who else could have appeared in the 1976 film Car Wash, two years after accepting a National Book Award on behalf of the reclusive Thomas Pynchon? Billed as "the World's Foremost Authority," Corey's guise as an absent-minded professor offered a way to poke fun at multisyllabic jargon and those who use it. When political or scientific authorities seemed to annex a chunk of language, there was Corey to claw it back — a very human antidote to our complicated modern times. "Sometimes, I forget what I'm talking about in the middle of a word," Corey said at his 100th birthday party, which was attended by WNYC contributor Jon Kalish. Corey mixed social commentary into his playful approach to language — as at his birthday party in 2014, when he said, "Ten years ago, we had Johnny Cash. We had Bob Hope and Steve Jobs. Today, 10 years later, there's no cash. There's no hope. There's no jobs." Here's how legendary theater critic Kenneth Tynan once described Corey: "a cultural clown, a parody of literacy, a travesty of all that our civilization holds dear and one of the funniest grotesques in America. He is Chaplin's clown with a college education." Born in Brooklyn, N.Y., in 1914, Corey and his brothers and sisters grew up in the Brooklyn Hebrew Orphan Asylum. After extreme poverty forced their mother to put her children in the home, she paid a monthly fee to help provide for them. Corey's left-wing beliefs led to him being blacklisted in the 1950s. Decades later, he was found to be panhandling in a Manhattan street. He told The New York Times that he donated all the money he collected to charity — often, to a cause that benefits children in Cuba. As Corey explained, he was asking for change around the corner from his home, navigating East 35th Street with his walker, handing out free newspapers and, over the years, collecting tens of thousands of dollars. When a reporter asked him why he hustled for change, he seemed confused. "Why?" Corey repeated — and after a pause, he said, "I want to help people out."